In essence, it tells the story of how humans gained our current understanding of space and time, and what that even is. Somehow, it manages to be not only entertaining but also almost spiritual in nature. A gorgeous show that changed my life. Also, Vangelis did a sizable chunk of the soundtrack which is, by the way, absolutely gorgeous. The whole show is also available on YouTube, just in case you had that excuse prepared. I watched both the original and Neil deGrasse Tyson's version. Time well spent. :-) Brian Cox has done some mindblowing shows/lectures as well. I have watched both as well. I liked the new one, but the original is something very special. 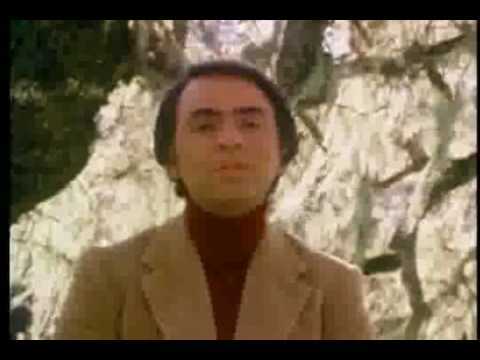 Carl Sagan was just an incredible person and his story telling and voice and the way he talked were in the league of his own and also the music score in the original was stunning. Those elements made the original an amazing series, which is next to impossible to surpass. Neil DeGrasse Tyson is a great person too, but he just can't compete with Carl Sagan. I don't think anyone ever can. No show or movie has touched me as much as the original cosmos -- yes, including you Babylon 5, Firefly, and the remake. The content of the original Cosmos show was tailored to require as little updating as possible. Still there are so many unanswered questions left today. It's a fascinating subject matter and I enjoy it quite a bit, even though I don't even own a real telescope. lol (It's on my to-do list... in no particular order). I haven't watched Sagan's version, but I'm really excited to use clips of Tyson's version in the classroom. I really liked how it told science from the standpoint of individuals with their own stories trying to solve the problems they were facing at the time. Sagan's version probably isn't as classroom-friendly, true.